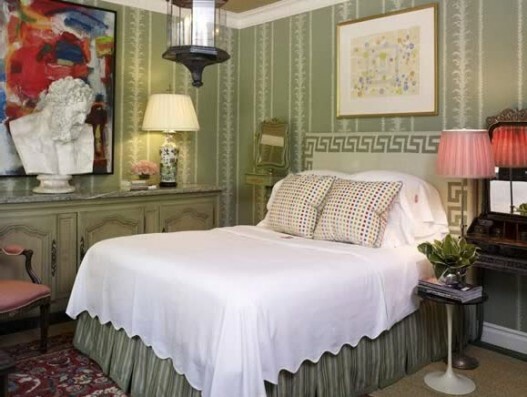 While browsing through some of my favorite portfolios I came across a familiar bedroom. I knew exactly where I had seen it before but there was something different about it, something missing. Then it all clicked, it was missing some RED. That one accessory that made this room POP. It's like searching for Where's Waldo in these photos- I keep compairing the portfolio image with the House Beautiful ones to see what's the same and what changed. While there are other changes besides the red throw, the power of one is really undeniable. The throw does make a huge difference! The color is perfect..looks like a poppy red to me. 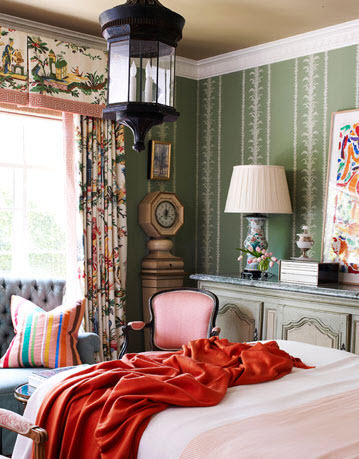 It really brings the bright abstract painting and the Chinoiserie print curtains into context with the otherwise muted space. I also like that they ditched the dowdy throw pillows in the HB shoot. Styling makes all the difference! OH! it looks the same but not :) Funny! Oh so tru. The bust was also hiding the colors in the abstract print! The red is divine! Just goes to show the power of a great stylist! So often I find myself drawn to a photo for these small pops of color -- a throw, a floral arrangement...it's the little things that can really make a room shine! 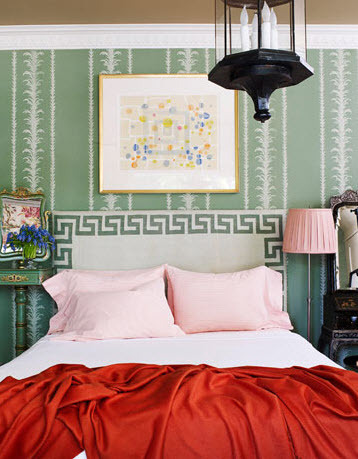 You're so right - that little bit of red to contrast all the green going on really made that bedroom! And where are his pink sheets??? 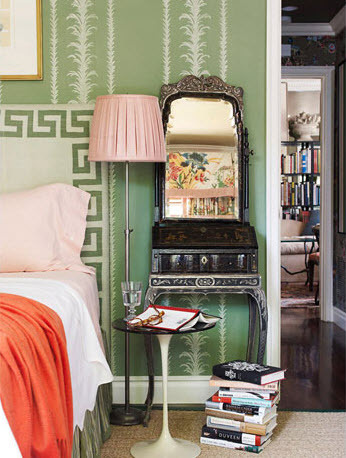 I also remember that room - because I'm in lust with that wallpaper!!! And it's called George Spencer - not sure if that's the manufacturer or design - but that's my grandfather's name!! Fate, I tell you. So true. The throw makes it - it's amazing how one element can change the look and feel of an entire space!! Great post! I love neutral tones but a pop of vermillion red and french blue are a must as far as I am concerned.You were on the money. The red made an unbelievable difference. Thanks for your nice comment! I agree- adds the extra pizazz! For some reason, the red around the edge of the book on the table popped out at me more than the throw. Great eye! I love noticing things like that - it really does show how much accessories and staging help a room "pop." You are so, so right it makes all the difference in the world. I love that you found this comparison; it makes me a little braver about adding color to my own home. Why do I find that so hard?! Yes, you are exactly right. Sometimes I think a red little can go almost anywhere. You have great eye for details! That's a pretty shocking difference, eh? I'm also always struck by how thinks photograph one way but don't always look so 'amazing' in person as they do in the photo. You said it! Most important rule in the color world, to have one, you must have the other, and it makes each one more special. I love that room too. Holy cow what a differnce that red throw makes. It takes the room from slight Grandma (sorry but i said it), too updated and comfy/cozy. The red is absolutely perfect. Shocking how that one item completely vamped up the room. I love that you showed this. It's amazing how you can style and completely alter the look of a room for a photo shoot!! The room is actually BAD without the red. It shows what good styling and photography can do!